Welcome, Curlbrook has been in existence for over 25 years and the founders Jane and Clive Kibble have a family connection to the curly which spans over 6 decades. 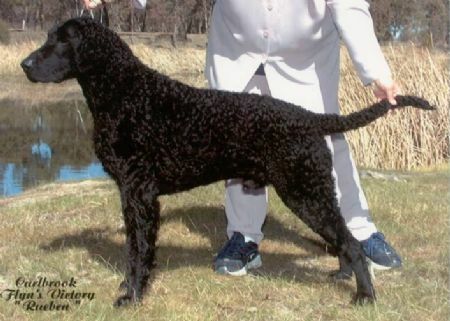 Curlbrook's objective is to breed curlies who are sound with great temperaments and are capable of undertaking any task set them, be it showing, retrieving, obedience etc or as loved family companions. Curlies are a unique breed, they are very affectionate and fit in well to family life, be it running and playing with the children or having a much enjoyed cuddle on the couch with the adults. The curly is a breed you need to own and love to know well. They are steady and easily trained. The characteristics of the curly is detailed on this website for your information. Curlbrook is now entering into a new phase of our Kennel, (sadly with Clive's death) the kennel, over the last few years has been less active, but now as my daughter and her family become more actively involved in this endeavour, we are excited to be able to continue to promote our beloved curlies who have been a part of our lives for four generations.